Oh look! There’s a wee skull in it. Metal. 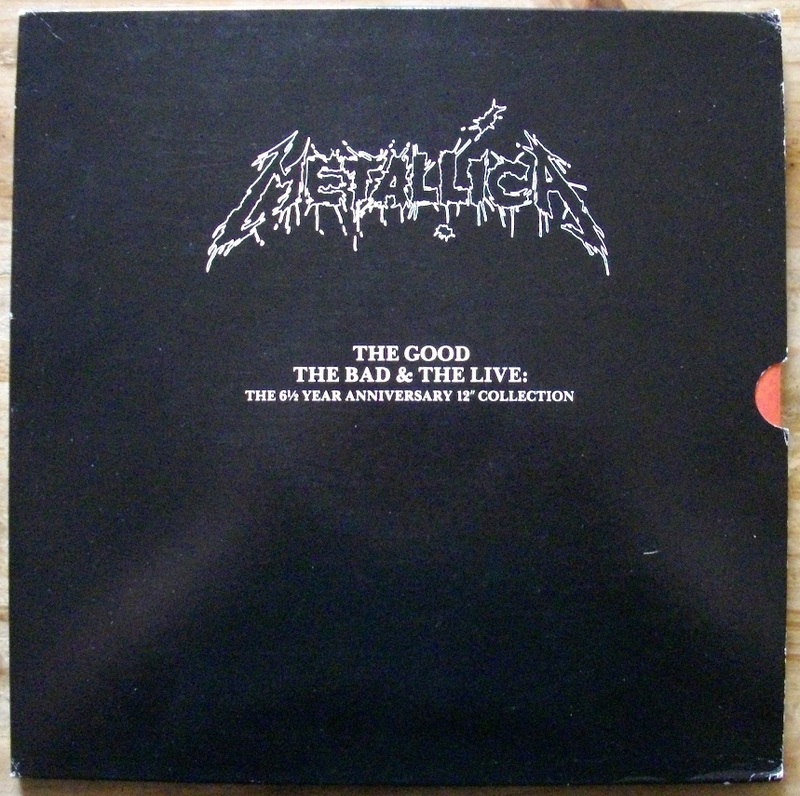 Metallica’s second European single was released after its parent album Ride the Lightning to promote the band’s European tour. 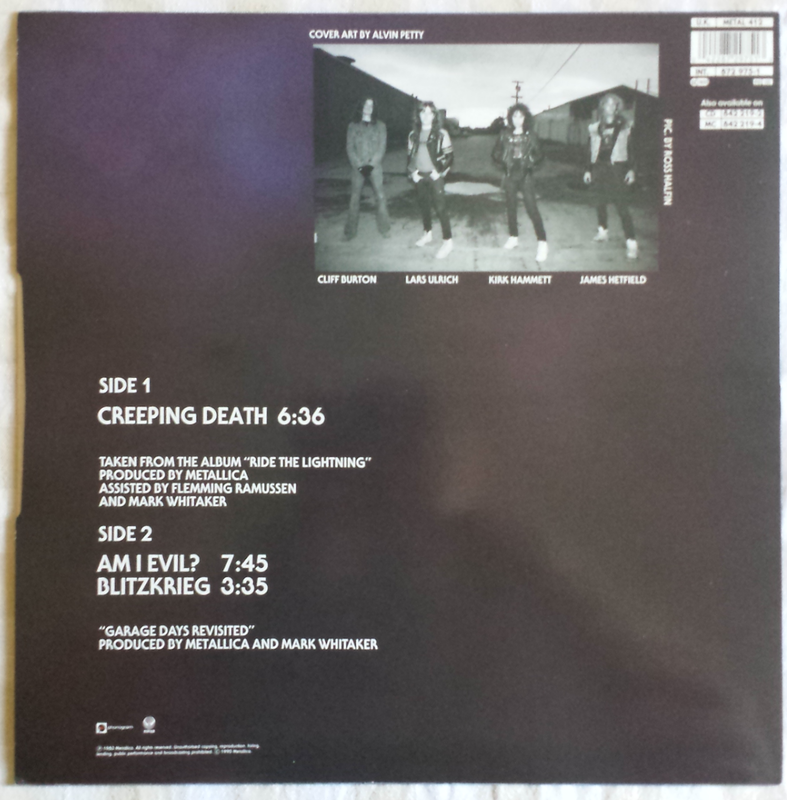 The A-Side song Creeping Death is a stone-cold Metalliclassic, a nuclear biblical epic. The B-Side Garage Days Revisited consists of two faithful covers of NWOBHM tracks (Diamond Head’s Am I Evil? and Blitzkreig’s Blitzkreig). Everyone would have already been familiar with the title-track when this was released but, especially outside the UK, fewer listeners would have known the B-Sides. It seems that the classic Metal bands of the 70s weren’t doing many covers and the few exceptions were songs lifted from outside the genre and given “heavy” treatment. But in the 80s bands like Metallica and Iron Maiden seemed keen to indulge in a bit of “Record Collection Rock”: recording many covers and, crucially, covers of other heavy and hard rocking bands. Both Maiden and Metallica proved vital in my musical education, pointing me towards other great artists (as well as some great films, books and TV shows). I miss the orange demon dude. Were Metallica simply self-serving in making these powerful, but largely unheard, songs their own? Or were they benevolently offering a helping hand (and some welcome royalties) to some great bands that hadn’t found an audience, for the greater good of Metal? I’d say there were elements of both but I would also credit Metallica for having the confidence to put an astounding song like Am I Evil? alongside their own, especially when Metallica’s sound and style was so clearly indebted to Diamond Head. But Metallica’s own compositions had more than enough firepower of their own and enough credit was given to their beloved NWOBHM heroes in interviews and on their T-Shirts to avoid accusations of exploitation. While Metallica’s cover versions of Am I Evil? and Blitzkrieg might not quite have the charm or impact of the originals, Metallica admirably put their own crunchy, barky stamp on both tunes. The realisation that there were older bands capable of penning tunes that could hold their own against a classic Thrasher like Creeping Death had many a fan, myself included, scurrying off to their nearest record store. The Metal genre, and my music collection, are much better off thanks to Metallica, one of the greatest gateway bands of all-time. The Box Set from whence this came! Never thought of them that way, but absolutely, they were definitely my gateway to metal! Full credit to Metallica, whenever they do a cover, the song ends up sounding like a Metallica tune. I’m thinking especially of the more recent ones like Turn the page, more casual fans may not even realize it’s a cover! Absolutely. I’ve been introduced to so many great bands by being a fan of theirs. They were invaluable. The Misfits, Budgie, Holocaust… the list goes on and on. Their covers might not always better the originals but they do put their own stamp on things and always choose great stuff to cover. I don’t think any band has led me to as many other bands as they have. I couldn’t agree more with every single word Mr HMO. Thank you Mr 1537. I remember you talked about Budgie and Metallica on your site… did you know about Budgie prior to Metallica’s cover of Breadfan? I’d heard of them through Kerrang! They always went on about them being a great lost band. I keep meaning to pick up that Discharge album. Metallica would have been my first exposure to Budgie but, even then, it was quite a while before I tried them out. I also remember Lee Dorrian recommending them in some kind of mix-tape article and being impressed by that. But, yes, Metallica are an awesome gateway band. I could do a massive list of bands I got into via them. Even indirectly… I got into The Misfits because of them but that leads on to Danzig and Samhain too. Do you mean the Garage Inc one with all the stuff compiled? I looked into that on vinyl but it was too pricey. I’m happy with the CD. If you mean the Garage Days EP, that was the reason I bought this box set. It wasn’t much more expensive than the EP and you got all the other singles and a bonus live single too. Garage Inc. I’m making do with one of those accursed silver discs too. Pah! This is one of my favourite Metallisingles, which I have on CD. Their version of Blitzkrieg is pretty damn great. I love the NWOBHM original but I think Metallica’s has become definitive for me! I wouldn’t argue with that. It’s an excellent cover. I definitely prefer the original Am I Evil? but Blitzkreig is a close call. Been a looong time since I’ve heard the original Am I Evil? but I understand. The first time I ever heard Kill ‘Em All, I was shocked by Blitzkrieg. I had no idea Metallica covered it until that moment. I think I fell in love that day. I can understand why people might prefer Metallica’s version of Am I Evil too. Again, it’s a great version and any preference becomes more about personal taste and context. I think they did a great job of The Prince too but my favourite Metallica cover might be Breadfan. Yeah, me too. That version alone got me to try Budgie. And now I love Budgie so there you go. Exactly! Me too. And both versions work really well. And it wasn’t just covers… I always loved Lars’ enthusiasm for bands in his interviews. He makes you want to hear the stuff. Yeah! I get that too from him. His liner notes to the NWOBHM CD were fun and made me want to hear more Diamond Head. Budgie are such an underrated band. Just played their first album again last night. Brilliant band. I hear Burke had a heart attack and has to take it easy now. Only got a few albums of theirs but they’re great. Should get more. Not heard the 1st one. The song “Guts” is just pure sludge Budgie. And “Homicidal Suicidal” is on there too. Cool. Definitely need that then! I recently put my Metallica collection back onto my iPod. 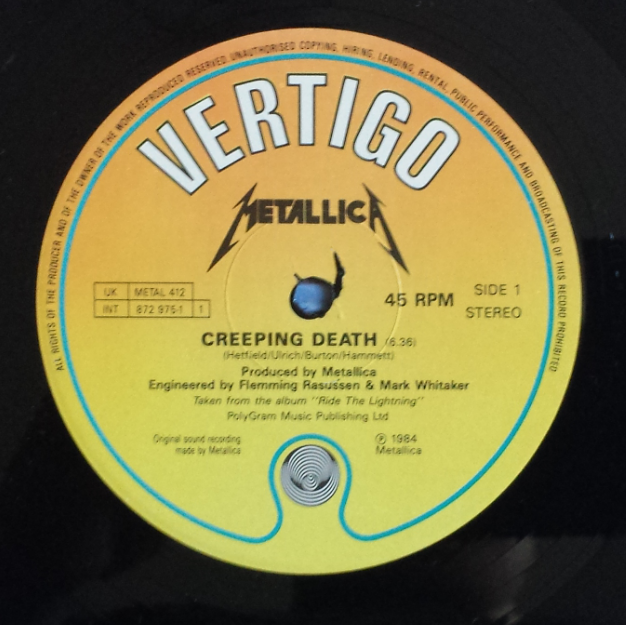 “Creeping Death” (or Ride the Lightning) was what I first listened to. Ride the Lightning, for me, is an absolute classic. “Creeping Death” was one of the finer songs penned in their heydey. Totally agree. Ride the Lighting is an all-time classic. It’s definitely a contender for my favourite ‘tallica record along with Puppets. And Creeping Death is easily a Top 10 tune of theirs. That must be one of their most played songs live isn’t it? Maybe… it always annoys me when people expect certain songs to be played. Like Deep Purple having to play Smoke on the Water every time… boring! That’s cool, I like the song and if its a new lineup then you want to hear their take on it… but they still don’t need to play it every time. But it’s a “crowd pleaser”. I suppose. I saw them one time and the cheers Smoke got compared to, say, Knocking On Your Back Door was so annoying. And Knocking was a better performance in every way. It’s a more interesting song musically too. I’m sure that’s just the people who only know one song…they’re everywhere. Yep… and the bigger the show the more there are of them! Bonus points for the wee skull. It’s also one of the best photo captions ever. Well done, sir. Strip away everything else (well, OK, not THAT far. Lars, put your clothes back on FOR THE LOVE OF GOD NOOOO) but dial it back and they’re really just greasy metalhead teenagers so in love with the genre that everything they do owes a huge debt. It’s only natural to do cover tunes. Bet if you looked into sales for Garage Inc it’d be beyond massive. Just wondering: Anyone here who came at this the other way? I mean, we all seem in agreement that ‘Tallica was the gateway to going back and discovering all the awesmeness that came before. Anybody here who was into all the awesomeness that came before and then along came Metallica? What do YOU think of them? Poseurs? Or rightful heirs? Diamond Head’s Brian Tatler said that when he wrote Am I Evil? he had no idea that it would feed and clothe him in the future! Even though I was never the hugest Metallica fan it was always their enthusiasm for the genre that made me check out bands they liked. And it wasn’t just from the cover versions. They’d talk about all sorts of bands in interviews too. Of course, their greatest contribution to the music industry would come much later when Lars started doing his excellent drum clinics. I think the $5.98 EP was their most significant album in terms of getting people interested in Metallica’s music, as well as Budgie’s et al. A few of my friends who liked Rainbow, Purple etc didn’t like “thrash”. It took these songs to get them to appreciate what Metallica could do. Yeah, totally agree with you on the significance of the $5.98 EP. The “Eye of the Beholder” cassette single was a big one for me too, it had “The Prince” and “Breadfan” on the second side. I wore that tape out! It’s cool to get a perspective from folk that were around before the Thrash stuff kicked in! That’s a great point about the covers getting people into Metallica’s music as well as the originals. Thanks – although now I feel old! Those Breadfan and Prince songs were great – I had them on 12″ I think…. Know what made me feel old recently? The 20th anniversary of In Utero. Heh – true. It was 25 years since …And Justice for all a couple of weeks ago. Didn’t know that! That’s not helping. Please don’t. I think Nirvana is somehow worse cause I still think of that as being “new” stuff. If only I could afford this in the mistaken green print! 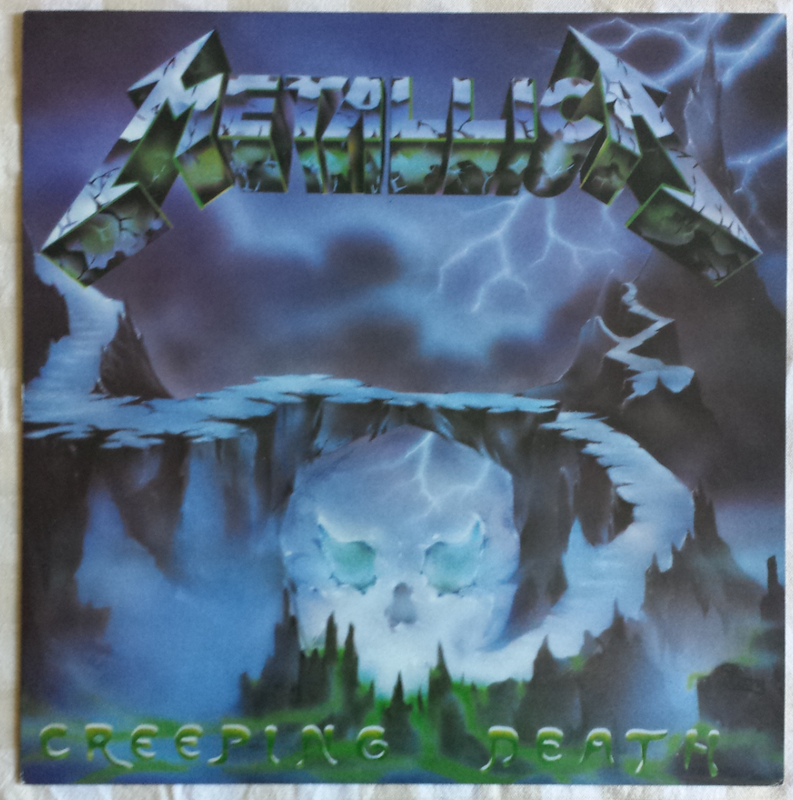 Creeping Death is one of the greatest metal songs ever written, let alone one of Metallica’s greatest songs! That bridge of “Die, by my hand”, in their live shows is just spine-tingling! It was very interesting to read your take on the cover songs too. Their version of “Am I Evil” was the first cover I heard them do, and being a 90’s kid, it turned me onto Diamond Head, and thus onto the other bands they covered! So I guess regardless of whether they do a “good job” covering a song, it’s always great to have that link between two bands. Tell me more about this green print? Don’t know anything about that. Totally agree with you on the excellence of Creeping Death, it’s a stellar track. Thanks for stopping by and commenting! If you’re into these Metallica singles I did a post on the Jump In The Fire 12″ you might want to check out.